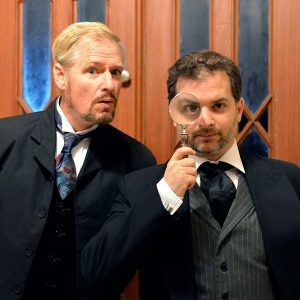 Sherlock Holmes (Tal Aviezer) and Dr. Watson (Mikel Von Brodbeck) are called to investigate the mysterious circumstances surrounding a baffling death, a menacing doctor with a menagerie of exotic animals, and a desperate client in need of help. Follow them on a trip through Victorian London (played by the inimitable Lyndhurst Mansion), on the trail of this classic mystery. Together with the famous detectives, we’ll move through the Carriage House and rooms on the first floor of the Mansion as we’re drawn deeper into the secrets of the case. Tickets are $40 for Adults, $35 for Seniors/Students (16 and under – appropriate for school-aged children and up). No member discounts are offered for theater performances.